Five remand prisoners including a notorious underworld character named N. P. Aruna Damintha Udayantha alias Aruna Udayashantha alias ‘Samayang’ and two prison officers died when an armed gang opened fire at a Prisons bus in Kalutara last morning. This gang of about 15 members dressed in police-type uniforms travelling in a cab fired gun shots at a prison bus transporting remand prisoners from the Kalutara Prison to the Kaduwela Courts and a prison van escorting it at Ethanamadala Kalutara around 8.30 am yesterday. Five prison officers were also injured in the shooting and one among them is said to be in a critical condition. Prisons media spokesman and Prisons Commissioner Thushara Upuldeniya said the armed gang in the cab had fired at the prison vehicles after blocking the road. The four other remandees who died are believed to be Samayang’s cohorts. They were K. Amila Prasanga Sampath, J Thilak Mallikage, Wadduwa Pathiranage Kelum Priyankara and C D L Prasanga Kumara. Thirty year old ‘Samayang’ was a resident of Ranala. He had been indicted in the Kaduwela Magistrate’s Court on several counts including for five murder incidents in Nawagamuwa and several other areas, and being in illegal possession of a T56 weapon. Among the injured prison officials are one Jailor S R Wijesinghe and Jail Guard S Tharmikan. A Guard named Buddhika who was seriously injured has been admitted to the Colombo National Hospital. Four other injured prison officials were admitted to the Nagoda Hospital and three of them are said to be in a critical condition. Police Media Director DIG Priyantha Jayakody said another underworld gang led by underworld kingpin ‘Angoda Lokka’ is believed to be behind the shooting. 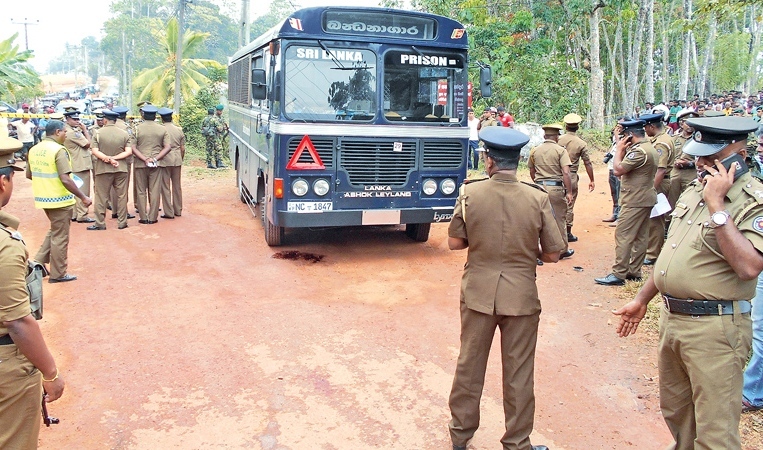 After blocking the prison bus at Ethanamadala, the gang had surrounded the prison bus and opened fire. After shooting the officer at the first door of the bus, they had forced open the door and gone near ‘Samayang’ and fired several gunshots at him till he died. Immediately after the shooting, the Kalutara Police as well as contingents from other police stations in the area rushed to the area and placed road blocks and other security measures to prevent the assailants from making a getaway. A special Police Crimes Division team has launched investigations into the incident to apprehend the culprits. 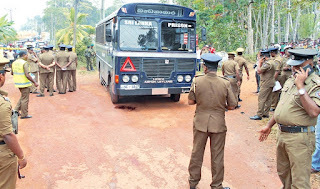 Meanwhile, the Department of Prisons yesterday started a separate investigation into the attack on prison bus in Kalutara that resulted in the death of seven persons including two prisons officials. These investigations are being conducted under the patronage of Prisons Commissioner General Tissa Jayasinghe.